Mayor of Blackburn with Darwen Cllr Alan Cottam, with members of the Royal British Legion at the commemoration event held outside Blackburn Town Hall. Taking place on Friday, 8 May Outside both Blackburn and Darwen Town Halls, ceremonies took place which included the observing of a two minutes silence at 3pm, which the Blackburn Town Hall ceremony being led by Mayor of Blackburn with Darwen, Cllr Alan Cottam. Lawrence Gilbertson, President of the Darwen branch of the Royal British Legion, led the two minute silence in Darwen. The events were attended by the Royal British Legion and other organisations. The two minutes silence was also observed at the local election count, which was taking place at King Georges Hall. At Wensley Fold Primary school, children held a street party on the Friday, which uncluded making gas masks, bunting and paper air-planes amongst other activities. 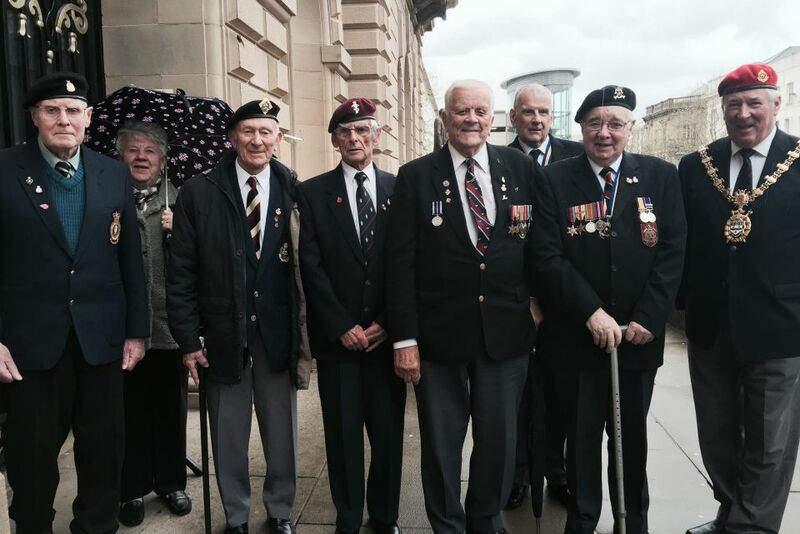 Two official parties for veterans and close family in both Blackburn and Darwen were also held, with the council making a £300 donation to each event. In Blackburn, the Royal British Legion hosted an Indoor Street Party from 8pm at St Stephens Club on Saturday, 9 May, for veterans and their families. Meanwhile in Darwen, a Garden Party for Veterans and their families at the Anchor Pub, Darwen was held also on the Saturday.